Exterior house painting can make your home look great. You can change the color of your home, decks, shutters and trim to really make it "pop". You can personalize it by adding as much detail as you like, but appearance is not everything. Painting your home is first about protection. And the best protection comes with the correct application of the paint. But, before there can be proper paint application, there has to be proper paint preparation. To prepare your home for a fresh coat of paint it first should be cleaned thoroughly. The best method is pressure cleaning using a chlorine and TSP (trisodium phosphate) solution. Chlorine is used to kill and remove mildew from the painted surface while the TSP removes dirt, pollen, grease and other pollutants. The TSP also removes any glossy finish that may hinder proper adhesion of the new coating. After cleaning, a close inspection should reveal any problems with insects, loose or missing boards or siding as well as any wood rot. Rot or soft wood needs to be addressed at this point. Depending on the severity of the wood rot will dictate what repairs will be needed. Loose and flaking paint should be scraped, feather sanded and primed prior to painting. Caulking around windows, doors and trim should be inspected and replaced if dried out and cracked using a high quality latex caulk. At this point, the house is ready for coating. Make sure to use the best paint affordable for your project. With such an undertaken, the longevity of the paint will determine how long before the process will have to be repeated. The better the paint, the longer it will last. 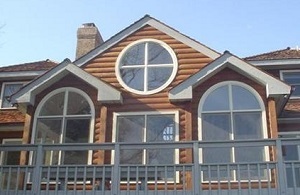 On your next exterior painting project, call Taskmasters Wood Maintenance. In the meantime, if you have any question, please give us a call, we love to help. If you are looking for a professional Littleton exterior painting contractor, please call us today at 252-266-9457 or complete our online request form.